A few years ago this patient visited Dr. Lam for consultation. Before he even uttered his first words Dr. Lam knew exactly what the problem was and how to fix it. Question was: did this young man have the donor resources left to make an effective repair ? If you look at the Before photo, on the left, you immediately notice unnatural sprigs of hair growing out of a bald scalp-and this was after an attempt to style it by brushing the hair into some sort of order with his fingers. It didn’t work (and couldn’t work) of course because there were just too few hairs in clumpy groupings and too much bald space between them. These hair sprigs were classic plugs. Old style surgery that often, if not always, left patients looking like that Before photo once more of the native hair fell out. But the potential to fix this patient’s hairline was extremely high because, as it turned out, Dr. Lam noticed that despite the fact the patient had two procedures prior to visiting there was still more than enough hair left on the sides and back of the head to effect a repair. In just one day Dr Lam was able to repair this old style hair transplant with true follicular units. Rather than 5 or more hairs per graft (plugs), Dr. Lam’s surgical team prepared thousands of 1-4 hair grafts (FUs) and packed them into the hairline and top of the scalp. The result ? A complete and total reversal of the problem. Now, instead of clumpy patches of unnatural hair on a bed of bald skin the patient enjoys what looks like a perfectly natural and relatively thick head of hair. And the best part is that his chances of losing it again are low to nil because the new hairs are resistant to falling out. 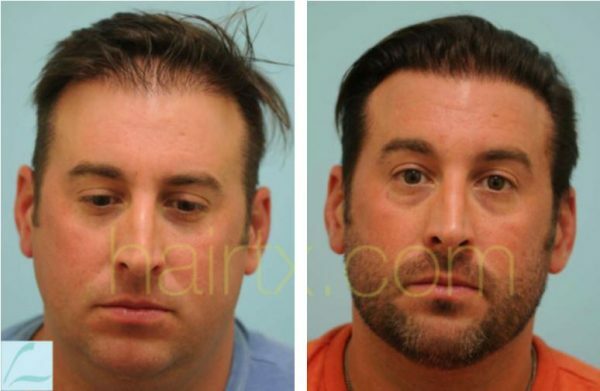 If you look at the After photo, the right photo, you will see a perfectly normal looking hairline with real hair bulk behind it. In fact, if you weren’t viewing this photo in the context of a hair transplant website you wouldn’t even notice his hair. And that’s the entire point of a hair transplant repair, to take attention AWAY from the hairline. Look at this photo of the same patient at a different angle. Pay attention to the very front of the hairline. See how easily you can see right through to the bald scalp ? See the uneven clumps of hair ? Now look at the After photo to the right. It’s the complete opposite. Almost no bald scalp can be seen and there is a uniform distribution of the new hair. In both photos patient used his fingers to style his hair. Because the volume of hair was increased by Dr. Lam the hair can actually be styled and controlled. 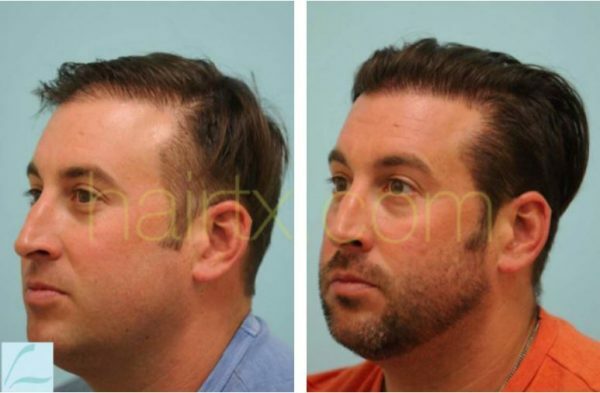 The repair of this old style hair transplant did not include the removal of the old plugs. Like a Jiu Jitsu move Dr. Lam and his team left the hairs in and simply filled in the bald spaces around them. This strategic filling covered the old style work and left him with a natural and full look. So the answer to the question is: YES, this patient did have the donor resources necessary to effect a cosmetically significant repair, but only thanks to Dr. Lam’s patience, skill, and experience.